"Every penny spent on Clare's resources is money well spent. I have many books and folders of resources from which to choose but I invariably come back to Clare's stuff as it's high quality, error free and doesn't usually need 'tweaking' to make it work for me." 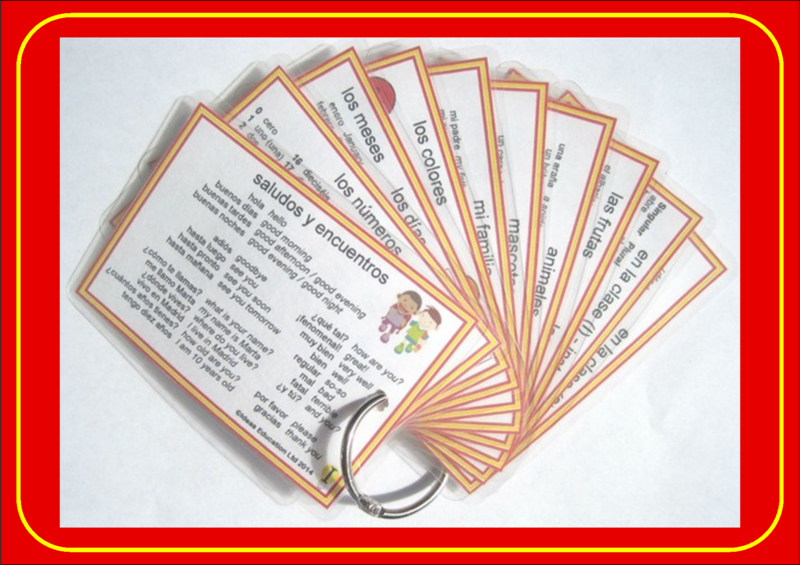 A set of 50 Spanish Challenge Cards designed especially by Clare Seccombe for learners in Key Stage 2 and lower Key Stage 3. A set of 10 Spanish Challenge Cards designed especially by Clare Seccombe for use by learners in Key Stage 2 and lower Key Stage 3 at Christmas time. The cards are numbered 51-60 as they are an extension of the original pack of 50 Challenge cards. The Challenge Cards are supplied in pdf format. A set of 50 French Challenge Cards designed especially by Clare Seccombe for learners in Key Stage 2 and lower Key Stage 3. A set of 10 French Challenge Cards designed especially by Clare Seccombe for use by learners in Key Stage 2 and lower Key Stage 3 at Christmas time. 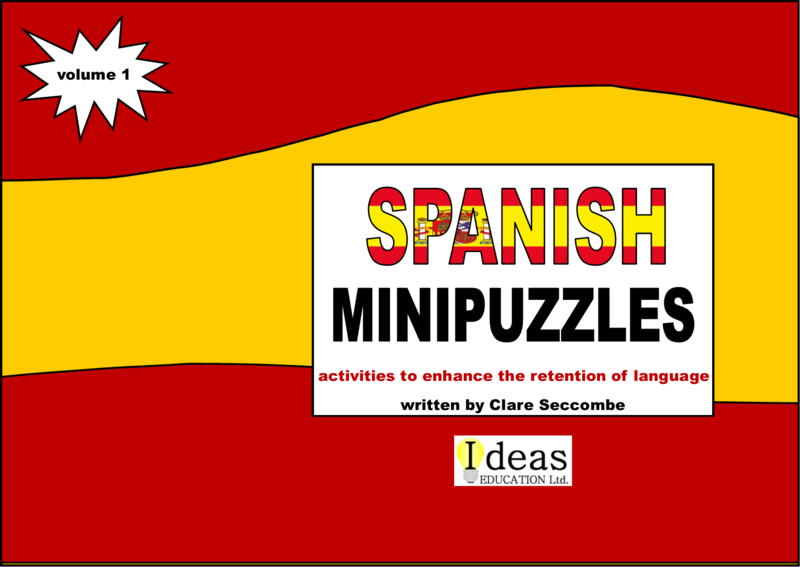 Sets of 8 Spanish pocket cards designed especially by Clare Seccombe to provide a reference for all learners of Spanish. .pdf file containing 9 pages. Each page has eight Pocket Cards on it. Eight of the pages have eight copies of one Card, the ninth has one copy of each of the eight Cards. Laminate and fix them together with a treasury tag or binder ring (see photo) for students to keep on their desk as a reference. Stick individual cards into exercise books as a reference tool. Give the cards to students for home learning. 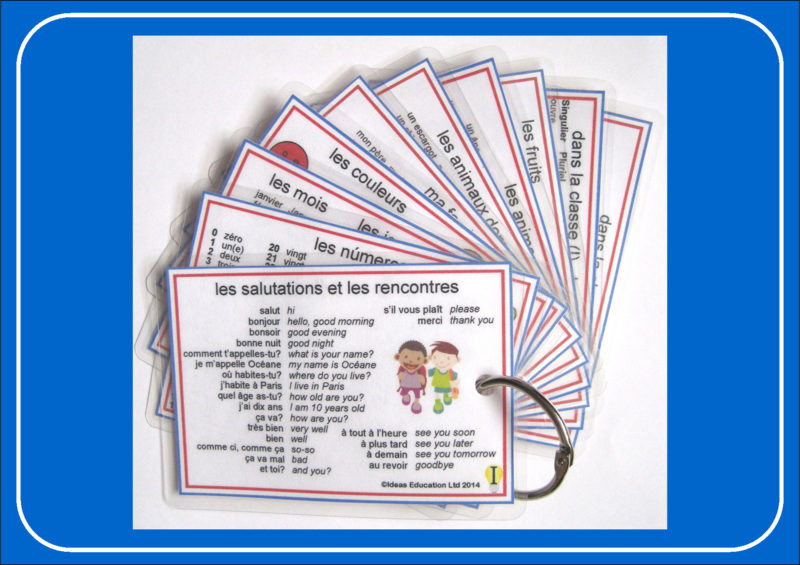 Sets of 8 French pocket cards designed especially by Clare Seccombe to provide a reference for all learners of French. A set of 94 minibooks to support reading, writing and grammar in Key Stage 2 Spanish. The language is built up from word level, through phrase and sentence level to text level, following the guidance of the Key Stage 2 Framework for Languages. The book also contains an overview and description of each minibook, as well as a comprehensive vocabulary list and instructions on how to fold the minibooks. The 20 numbers minibooks (from the complete set of 94). They work through 1-6, 6-16, 16-31 and 31-1000. "worth spending the money when you know it's resources created by someone who actually uses them in the classroom"
"New resource Soy prehistórico is the bees knees - cross curricular, innovative and fun with clear simple to follow instructions and all the resources you need provided for you. I'm just working out which class gets to try it out!!" This resource comprises a series of 30 sheets of activities designed to support learners while they begin to learn and commit to memory the new Spanish words. There are two sheets for each language area, the second each time being more challenging than the first. A full answer key is given at the end of the resource. 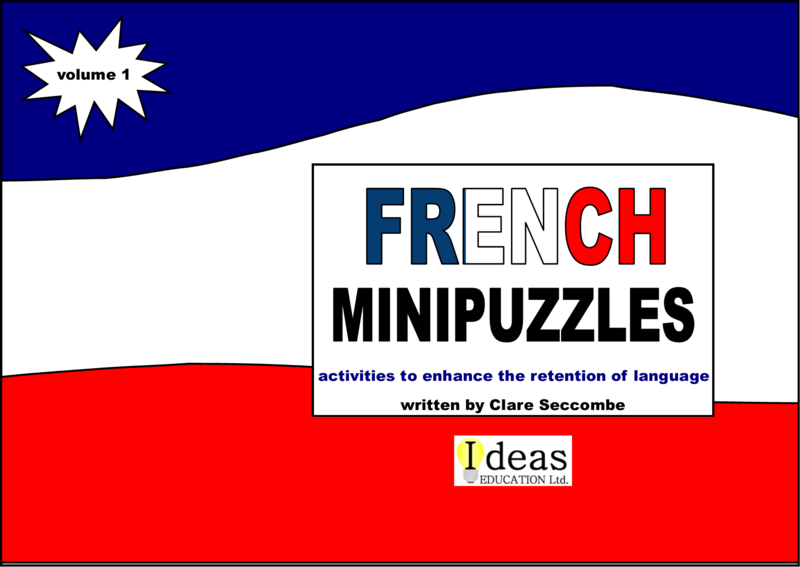 This resource comprises a series of 30 sheets of activities designed to support learners while they begin to learn and commit to memory the new French words. There are two sheets for each language area, the second each time being more challenging than the first. A full answer key is given at the end of the resource. A set of 50 French Grammar Challenge Cards designed especially by Clare Seccombe for learners in Key Stage 3. They would also be suitable for learners in Key Stage 4. A set of 50 Spanish Grammar Challenge Cards designed especially by Clare Seccombe for learners in Key Stage 3. I have been sharing resources and blogging about them for many years now. These 130 activities are ones that I have either used in the classroom over the last 20+ years, or blogged about at some point, or both! Many of the activities included cover more than one skill, so for ease of reference there is a key to show what it covers. Most of the activities can be adapted to suit different age groups, ability levels and topic areas. I hope you enjoy browsing through the activities, and that you find some that you didn't know about, and even some that you did know but had forgotten! So what do you get? A 38-page PDF book containing descriptions and examples of 130 different activities that can be used in language teaching. This resource is designed to support beginner learners and non-specialist teachers of French. It provides explanations and activities to practise the grammar of nouns and adjectives that is given in the Key Stage 2 national curriculum for Languages. This resource is designed to support beginner learners and non-specialist teachers of Spanish. It provides explanations and activities to practise the grammar of nouns and adjectives that is given in the Key Stage 2 national curriculum for Languages. The starters are provided as PowerPoint slides which can be projected on the interactive whiteboard or printed out for students. The index and all activites have hyperlinks to provide easy navigation. Answers are provided for all activities. A sample of this resource can be downloaded from here.